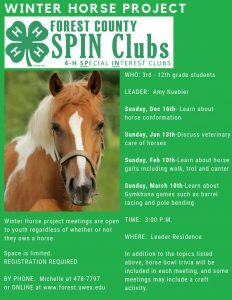 Winter horse project meetings are open to children grades 3rd-12th regardless of whether or not they own a horse. All meetings will be held at the residence of Amy Kuebler.on the second Sunday of the month at 3 pm unless otherwise specified. 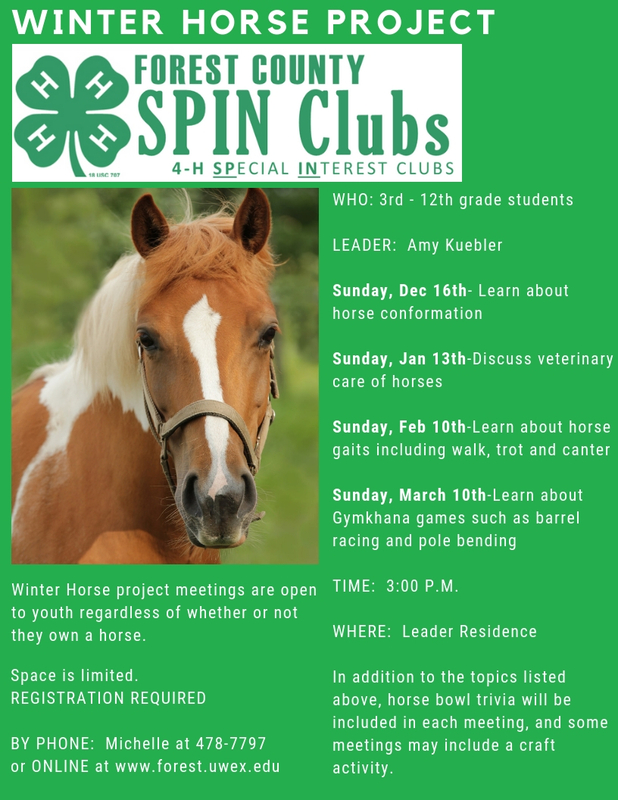 In addition to the topics listed below, horse bowl trivia will be including in each meeting, and some meetings may also include a craft activity. Feel free to bring a light snack for the group. Parents are encouraged to attend meetings. 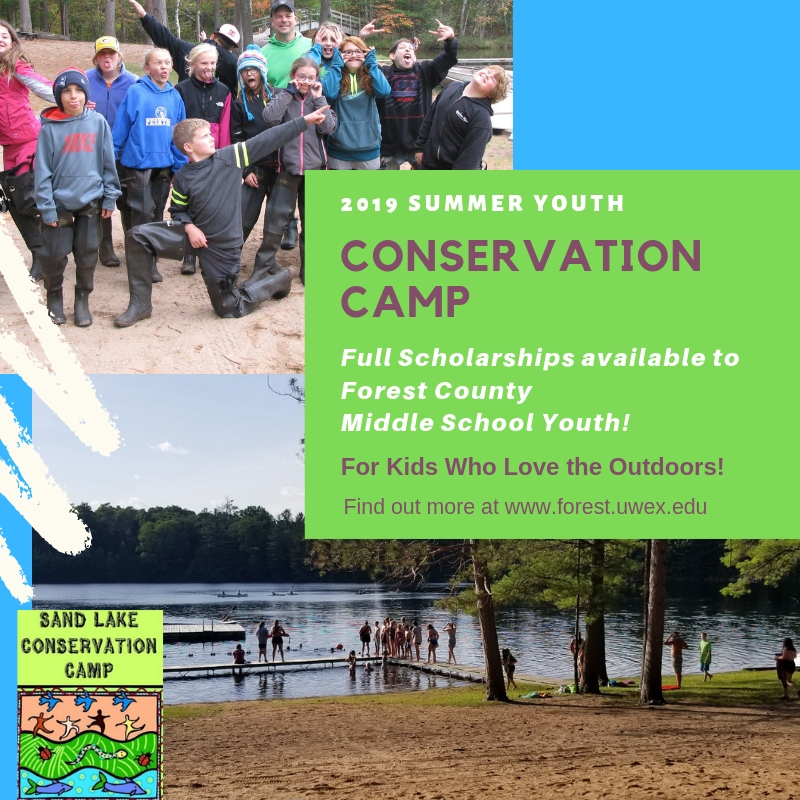 To register please call Michelle at 715-478-7797 or complete this online form. Dec 16th, 2018 Will judge horse conformation which is defined as the correctness of bone, musculature, and balance of proportions. Will use both illustrated examples and Amy’s personal horses as examples. Jan 13th, 2018 Will discuss veterinary care of horses including appropriate worming practices, vaccines, and Coggins testing. Will use Amy’s horses to demonstrate appropriate tack up procedure for horses. Feb 10th, 2018 Will discuss and watch videos displaying various horse gaits including walk, trot, and canter. Will use Amy’s horses to demonstrate various gaits on the lunge line (if weather allows). Will help children determine the correct lead of the horse. Will hold tack scavenger hunt. 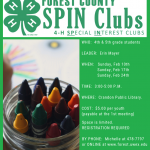 March 10th, 2018 Discuss common Gymkhana games such as barrel racing and pole bending, rules for participation, and scoring. Discuss equipment use and placement. Review and demonstrate on foot the patterns of these games. Discuss State Gymkhana Expo.